This week the World Trade Centre Dublin will take a brief glance into the global silicon market; in respect to its use in the technology industry. Silicon is the basic form of the material used to make computer chips, transistors, silicon diodes, as well as other electronic circuits and switching devices, this is primarily due to the atomic structure of the element making it an ideal semiconductor. Silicon itself is the second most common element in the Earth’s crust; it is used in many industries from metallurgy to energy production, with the levels of purity denoting its possible applications. Within the technology sector though, referencing to the material as purely silicon can be seen as a very general, in fact a highly pure form of silicon often >99.99% pure is used in the electronics and solar photovoltaic industries currently (known as crystalline silicon). According to the Observatory of Economic Complexity, this very pure form of silicon is the 593rd most traded product in the world as well as being the 3rd most complex product in the world according to the Product Complexity Index (according to 2013 data available). This material has become more and more commonly traded as the technology industry has evolved over the last few decades. The OEC shows the largest exporters of >99.99% pure silicon in 2013 were Germany, USA, Japan and South Korea, while the top importers include China, Japan, South Korea and Singapore. Pure silicon is rarely found in nature and as such is manufactured using a very complex and controlled process. The main product of this purification process is called poly-crystalline silicon (also known as polysilicon), before 2000 more than 80% of polysilicon was consumed by the semiconductor industry, this has since shifted with large scale production of silicon based solar cells consuming the majority of produced polysilicon. Silicon is widely known as a necessary product for use in the electronics industry, most notably for semiconductor and microchip production. Due to this many of the world’s hotspots for technological innovation bear the name of the element, the most famous of these being the Silicon Valley in the United States. The nickname of the Silicon Docklands has also arisen closer to home in the technology intensive Dublin docklands area, home to the European Headquarters of many of the most famous internet and technology companies of the world such as Google and Facebook. There are many steps involved in the conversion of the most common form of silicon in silica sand to the crystalline silicon used in a microchip. To avoid a long and technical description by myself Techradar give a summary of the many processes involved in this manufacturing process in their article here. During 2008-2014, 60-80% of polysilicon was consumed by the solar industry. This large increase in demand for polysilicon firstly raised prices significantly in 2008. The undersupply was identified and new producers flooded the market with polysilicon, cutting the price dramatically (Fu et al, 2015). This occurrence has made the solar industry more competitive than ever before and also opened it up to large scale Chinese manufacture. Due to silicon’s relative abundance, crystalline silicon has also become a popular choice of semiconductor material in the production of photovoltaic (PV) solar cells and modules. In terms of solar PV cell efficiency the higher the purity level of the crystalline silicon used the higher the overall efficiency of the cell. The hub of solar cell production has moved in recent years from Germany, where incentives were created to encourage production originally to China, where with the drop in the price of silicon in 2012 led to mass production of solar PV, flooding the market with much more affordable solar pv modules, as discussed previously. This rapid increase in poly-crystalline silicon production led to claims of dumping in both Asia and Europe in recent years, seen for example in this Reuters article. With crystalline silicon currently providing relatively high efficiency factors as well as being able for mass production, a recent MIT study suggested that in terms of development of the solar energy industry, the continuation of its use is necessary in the industry for the time being. Future innovations in the creation of PV cells will be in the creation of more transparent, lightweight and flexible cells, but before suitable replacement materials and innovations are made that allow for this at an efficient cost; MIT suggest that rapidly scaling up current silicon-based systems while this work continues on will increase efficiency, decrease material use and reduce manufacturing complexity and cost. 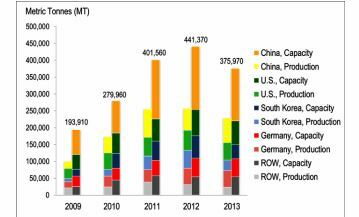 At the moment, China is dominating the market in terms of crystalline silicon production. Although it is mainly produced for the solar pv market, its highly energy intensive production process is actually making the production of a solar pv module very energy inefficient. New startups are trying to examine this problem and see ways to make the carbon footprint of the pure silicon used in solar panels much lower. For example, one Silicon Valley start-up; Silicor Materials has set up its industry in Iceland of all places. This is mainly due to the cheap and plentiful clean energy from geothermal resources that Iceland happens to be abundant in. The silicon industry is not the only energy intensive industry to see this opportunity, not only to promote a clean corporate image but also to cut costs dramatically. All in all, it would seem that the silicon and polysilicon production industry will not fade away anytime soon, it has been the material that has brought us many of the greatest technological achievements of the computer age and will not doubt be one of the prime materials in our technological advancement of the future.